Many people have asked me about my last post. So let me allow Robert to elaborate here via video, because it is a *very* good deal. If you have a favorite project on GlobalGiving, now is the time to act. With relatively modest effort, you can dramatically increase the chance the project may be awarded an additional $50,000. This is the democratization of philanthropy at work. The Case Foundation and Parade Magazine are putting up $50,000 for each of the four projects on GlobalGiving that attract the most donors through a single fundraiser. That's right - the highest number of donors, not the largest amount of donations. Minimum donation size is $10. And even if your project does not win $50,000, it will still be eligible for one of fifty $1,000 runners-up prizes. Seriously, this is a great deal - don't pass it up. The old thinking goes that to change the world, you have to give millions. But young tech-savvy philanthropists are trying to prove otherwise. Leveraging new technologies and the growth of social networking Web sites, several online-giving pioneers have been trying to expand the pool of potential donors by democratizing philanthropy and making it more transparent. "This is pretty revolutionary, that technology allows us to do this," Whittle said. "It used to be that if you wanted to give and have an impact, people thought you had to be Bill Gates or Oprah Winfrey. But because of the way the technology works, you can be an 'ordinary Oprah.' If you've got $10 or $100 or $1,000, you can come and find a school in Africa to support, and you can get updates from the field to get responses to your support. This is from a very nice article by Philip Rucker in today's Washington Post talking about how the Case Foundation is working with GlobalGiving, Network For Good, and Parade Magazine to encourage online giving. Parade Magazine has 70 million readers! The Case Foundation is providing $500,000 to the causes that attract the most donors - not necessarily the ones that raise the most money. This makes this a real exercise in the democratization of philanthropy. You can participate in the $500,000 challenge here. It goes live on the web today at 3 pm EST. Tyler Cowan is a rare combination of a good academic and a savvy self marketer. 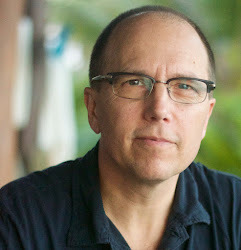 His blog is one of the most widely read in the world. One reason for this is that the content is good. But what separates Cowan from many others is that he reassures his readers early and often that he is an authority by prominently citing what others say about him. Two books that show economic intellect to advantage are Discover Your Inner Economist, by Tyler Cowen and One Economics, Many Recipes, by Dani Rodrik. Cowen's book is a set of observations on everyday life, while Rodrik's book looks at the high-level issue of which economic institutions to recommend for underdeveloped countries. I made the case for Cowen's book here and the case for Rodrik's book here. Note that in this quote, he is careful not to single himself out to make himself seem to self-aggrandizing. Instead, he adds Dani Rodrik into the mix. This serves the additional function of signalling to the reader that he is in the same league with Dani Rodrik, someone who (at least until recently) was much more widely known and respected. Flavor of the day? Not. 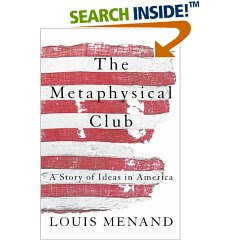 I finished The Metaphysical Club by Louis Menand last night. It is sort of an intellectual history of the United States, covering the period right before the Civil War until about World War I. The main stars include Oliver Wendall Holmes, William James, Charles Pierce, and John Dewey. These guys were discussing many things that we assume are "new" today - the wisdom of crowds, complex adaptive systems, and the nature of uncertainty. They realized that hewing to rigid principles and old certitudes was futile, even dangerous. Together, they created pragmatism, in which keeping the public debate and political process open to dissenting views trumps any underlying theoretical framework, which, after all, might be proven wrong by the next round of scientific research. Many of us are drawn to rigid principles and sweeping theoretical frameworks, because in the short term they make life easier to understand and navigate. But Holmes, James, et al realized that the world is too complex to be described -- much less navigated or molded -- by any such certainties. GlobalGiving is featured as a "Rising Star" in this month's FastCompany Magazine. Check out GlobalGoodness, the new blog that allows you to see what's going on behind the scenes here at GlobalGiving. It features posts from GlobalGiving staff and an occasional guest blogger. The goal is to provides a preview of upcoming features and to point out trends we think are important. We will also highlight other organizations we love. I will keep writing here at Pulling for the Underdog on a variety of topics that strike my fancy, but if you are looking for the inside scoop on GlobalGiving, then GlobalGoodness is the place to go. That is the concluding paragraph from Danny Kahneman's Nobel prize autobiography. Kahneman, a professor at Princeton's Woodrow Wilson School, was awarded the Nobel for economics in 2002. Much of the work he was recognized for was done with Amos Tversky, who died in 1996. Kahneman's piece is one of the most lovely autobiographical sketches I have ever read. It provides a highly engaging survey of breakthroughs in economics and psychology over the past forty years. So if you are a student in either field, that makes for mandatory reading. But more important, it is a generous and moving account of the nature of friendship, which makes it great reading for everyone. If I buy shoes from Zappos.com and they don't fit, I can send them back for a full refund — no questions asked. They even refund shipping costs! If I buy a coat from Nordstrom's and my wife doesn't like it, I can take it back to the store — no questions asked. But what would happen if you asked your favorite nonprofit or charity group for a refund? Margaret Su, one of our colleagues here at GlobalGiving, asked this question earlier this year. "We claim that GlobalGiving is a 'whole new way to give.' We place a premium on showing donors exactly where their money goes -– and the impact it makes. Why shouldn't we provide a refund if a donor is not happy?" I told Margaret, as gently as I could, that she was naive: "That is crazy, Margaret. Philanthropy doesn’t work that way. We can't do that." I had a thousand reasons to blow her off. But her idea nagged at me, and I couldn't shake it. I brought it up at the management team and then at the board. The response was always the same: "That's crazy, we can't do it, it's impossible, etc. etc." Over time, though, we started to think that the idea might be not only possible -– but critical. And not just to donors, but also to the organization. A guarantee could compel us to put front and center questions of how to amplify the impact of our work, hold ourselves accountable to our partners, and ensure donor trust. Each and every day. Today we’re putting our money where our mouth is with the announcement of Global Giving Guaranteed. Starting today, if a donor is not happy for any reason with his or her experience on GlobalGiving, he or she can get a refund. The refund comes in the form of a voucher the donor can use to give to any other project he or she wishes. (If the IRS allowed it, we would even refund donor's money in cash.) The guarantee will cover up to $10,000 per donor, per year, at the beginning, but we may increase this ceiling if it makes sense in the future. We see GlobalGiving Guaranteed as a new way to demonstrate the confidence we have in our project leaders, who are good people making a big difference with a relatively small amount of funding. But the guarantee also brings direct market discipline to bear on us. We make promises about the speed at which donors' money will get to the field, and we promise donors that they will get regular updates from the field from project leaders. Starting now, the guarantee creates a feedback loop with teeth. We also believe that donors deserve to be treated at least as well as consumers. After all, they are trying to help improve the world with their dollars. They have the right to know how their money is being used — and to redirect that money to a different purpose if they are not satisfied. You may be thinking this is a real financial risk for a small organization to be taking — and you are correct. But we believe that ultimately the benefits far outweigh the risks. Study after study has shown that the positives outweigh the drawbacks for providers of guarantees. Does the guarantee mean that all projects listed on GlobalGiving will succeed in terms of their objectives? Of course not. Most projects on GlobalGiving succeed in improving hundreds or even thousands of lives. But, like anything else in life and business, sometimes development initiatives fall short, for all kinds of reasons. We will, however, guarantee that from here on out, donors can play an active role in the conversation. Months ago, I told Margaret that a donation guarantee was a crazy idea. That isn’t how philanthropy works, I said. But today, I believe that it is. What do you think? I also think that there is a role for grants in generating the funds necessary to continue helping the poorest borrowers and savers take baby steps towards establishing themselves as legitimate financial services consumers. That is Julia Brown over at the Women's Initiative, whose good post I recommend reading in full. She was responding to my earlier post arguing against subsidizing interest rates on microcredit in most cases. Reaching the poorest of the poor, especially in rural areas, requires a great deal of overhead in terms of physically reaching the borrowers who may be widely scattered and maintaining the contact necessary to reduce default rates. I agree with Julia on the high overhead cost of reaching the poor in rural areas. I also agree that in some cases subsidizing this overhead may be a more cost-effective way of helping the poor than many other aid programs. However, experience has shown that the best thing is to subsidize this overhead directly. Subsidizing interest rates tends to distort incentives at the margin, politicizing the loan process and masking the true cost of doing business. In any case, thanks to Julia for a nice post. "Oh, we have eight Java coders working on our site..."
This is what the CEO of a small online organization told Mari recently at a conference. He does have a nice site. But I was floored to hear how many coders he had. GlobalGiving has about fifteen staff, but we have only two Java coders. Everyone on our team used to complain about the pace at which we were introducing new features. Our users had lots of great ideas for what they would like to see, but it was impossible to implement all of them. Naturally, Steve was pretty crabby sometimes, since he was working like a maniac. I will admit it: sometimes I felt like wringing his neck for being so grouchy. But when I think about the technical resources available to other online organizations and companies our size, I realize what an amazing job Steve has done. About six months ago, Steve upped our coding game considerably by finding and hiring Kevin Conroy. While Steve began focusing more on the deep architecture of the site, he turned Kevin loose on the front end. Within a few months, we released an entirely new version of the site, and we have been steadily rolling out new features every couple of weeks. Someone told me recently that "GlobalGiving punches well above its weight." In other words, our influence considerably exceeds our actual size. Steve and Kevin are two of the rock stars here at GlobalGiving that make that possible. Noi Chudnoff died suddenly yesterday after a freakish accident. She was an extraordinary person. She came to the US from Thailand in the 1960s at age 17, and started off scrubbing floors in a nursing home. After attending college, getting married, and raising a son, she decided to take off her apron and start a business. This turned out to be the famous Go Mama Go store on 14th Street here in Washington, DC. She was a succesful business woman and a feisty philanthropist. Noi funnelled most of her profits to the gay and lesbian communities, Concerned Black Men of America, a local HIV/AIDS clinic, and other groups that were disdvantaged or discriminated against. No one pulled for the underdog around here more than Noi. She was an inspiration and will be missed. Read about what some of her fans say about her here. "There is no silver bullet in development and poverty reduction. Some things can be funded through microcredit and others need grants." To be successful, Whittle said, people need such basics as health care, clean water, education and transportation. These "basics" - the things that people need to be healthy, hold productive jobs, and live a dignified life - are the things that we provide through GlobalGiving. Charge 80% per year on a loan in the U.S. and you're called a usurer. Charge 80% on a loan in Latin America or Africa and you can be a poverty-alleviation charity. They are right about the appropriateness of charging market rates of interest for micro-credit in developing countries. But they are wrong to conflate that with charity or grants. In fact, subsidizing micro-credit via lower interest rates is usually a bad idea. One of the most successful micro-credit schemes in the world has been KUPEDES in Indonesia. When I was working in Jakarta for the World Bank in the 1980s and early 90s, KUPEDES was charging about 33% nominal rates (20% real). Their surveys showed that their borrowers were much better off, and get this: KUPEDES was also the biggest money maker for the bank involved, BRI. It was a real win-win. Few people have heard about KUPEDES. You know why? BRI's management hated the limelight. They intentionally did not brag about their success because there would have been pressure on them to lower their interest rates. BRI's management understood that, in order to be sustainable, the program had to be run on market principles. I know this first hand: in the late 1980s I tried to lend BRI several hundred million dollars at subsidized rates, and the president told me no. I was shocked! Who would turn down cheap money? He said they would rather raise the money from deposits, since that was healthier. I asked him where they were going to get the deposits, and he pulled out a ledger showing me that their branches were mobilizing a lot of savings from the same communities they were lending money into. That taught me a lesson about microcredit I have never forgotten. First, it is possible to create a microlending program that serves the poor and is profitable and self-sustaining. But to succeed the bank units will need to lend at market rates, use their income to finance their operations, and devise appropriate savings instruments to attract depositors. Second, developing a savings instrument for the poor is at least as important as providing them with loans. In Indonesia, SIMPEDES, the village savings program, attracted thousands of depositors. And by mobilizing rural savings, it not only provided the banks with a stable source of funds, it also kept financial savings in rural areas, thus helping continue development in the countryside. People sometimes ask me if we need official aid institutions or big foundations if GlobalGiving exists. They say GlobalGiving is much more efficient, open, transparent, and direct, and that it has much better feedback loops. I am flattered by their question. But after nodding smugly to them, I have to be honest. Improving economic, social, and environmental conditions requires a plethora of different organizations mobilizing ideas, energy, and money in many different ways for many different activities. This morning a reporter called me to ask my opinion on eBay's new Microplace, and how it compares to Kiva. He was breathless about the potential of micro-credit and at the same time was breathlessly hoping to stir up a battle between Microplace and Kiva. At the end, he asked me "Which one would you recommend I personally use?" "They both have a role," I replied. "They do different things in somewhat different ways. Microplace gives you a financial return, but provides at first glance seems to provide less of a direct connection to the borrower than Kiva. Kiva provides no financial return to the lender but seems to provide a more direct connection to the borrower. Both go through intermediaries to actually lend out your money, but they work with their intermediaries in different ways." "And what about micro-credit in general?" he said. "Should I only do micro-credit? Is that all it takes to improve lives?" "Well," I replied, "improving lives requires a wide range of things. In general, good jobs are by far the best way to pull people out of poverty. But getting people into good jobs requires different things in different circumstances. First, basic literacy is a huge factor (especially for women) in being productively employed in the modern economy. So you may want to support education. "The same with health: it is hard to be productive or hold down a job if you are constantly sick because you drink dirty water or if you suffer from malaria, or if all your assets were wiped out in a flood. If you have a basic education and are healthy, in some cases you can increase your income by taking out small loans and starting your own business. "In other cases you are better off taking a job with a growing company. And the pace at which companies can grow and offer employment is in part also dependent on a country's trade and other macro policies, along with their roads and other infrastructure. "The bad news is that there is no silver bullet -- not philanthropy, not microcredit, not policy reform, or anything else for that matter. "The good news is that you now have multiple avenues for getting directly involved to a degree that was never before possible. Pick whichever one is most gratifying to you personally and go for it, whether it be GlobalGiving, Kiva, Microplace, or domestic alternatives such as DonorsChoose or Modest Needs." The paradox is this: to take action, individuals often have to fall in love with a specific organization, initiative, or idea, and become almost fanatic in their support for it - sometimes to the exclusion of other things. But real change happens when a lot of different people fall in love with a lot of different things. It happens, in other words, when you have well functioning marketplace. "Oh, it's not really about the gas mileage, it's about the power. This thing has 340 horsepower, and will do zero to sixty in under six seconds, and I can still feel good about it." - new owner of a Lexus hybrid. When we started GlobalGiving a few years back, there was much fanfare about the concept of social return on investment. The idea was that philanthropic donations are analogous to financial investments, except that the return is social in nature (# of children educated, workers trained, etc) rather than financial. But I soon realized that most people do not use an "investment" mentality to make decisions about their philanthropy. Instead, I found, philanthropy is much more like consumption than like investment. People derive immediate gratification from the act of donating and supporting a group. Often a donation is much more about the donor than the donee. Katherine Fulton of the Monitor Institute agrees that philanthropy is not like investment. A couple of years ago, she defined philanthropy as "an expression of values" by the donor. I thought this was right on, and I started using her definition instead of my own. But lately I have started thinking that maybe we are saying the same thing. Consumption often is an expression of values, not simply a calculated act of getting the most for your money. One of best known examples of this is the popularity of the Toyota Prius. By most analyses, it takes many years of driving to recoup the extra cost of the the hybrid engine, despite the much higher miles per gallon. When you ask people why they buy the car despite the long pay back period, they will often say "Oh, well I bought this thing just to show I care about the environment." Here is another example. I recently bought a Subaru Outback. It is a very popular car among people who care about the environment, and I have been amazed at the "brand" that this car has built among environmental activists. I like this car for performance reasons (it will go anywhere, winter or summer), and I like being a card-carrying member of the enviro-community. But here is a paradox: My Subaru gets lower gas mileage than many BMWs. And last weekend while at the Solar Decathlon on the mall in Washington, DC, Mari and I ran into a friend. She told us she was going to install solar panels on her roof. I told her that we had considered that but that the payback period was so long it did not seem feasible. "Oh, I am not doing it for the pay back, I am doing it because I like the idea of solar power." So consumption is often "an expression of values," too, just like philanthropy. I am sick and tired of flying. I fly so much - back and forth to the west coast all the time, up and down the east coast occasionally, and then overseas a couple of times a year. I can't stand the airport, the waiting lounges, the crowded planes, the long waits, the jet lag and the arriving in Oakland at midnight and having to drive 45 minutes to get to my hotel in Palo Alto. It turns out the earth can't stand me flying so much either. Today, I took an eBay-sponsored carbon footprint test here at the PopTech conference. The average American has a carbon footprint of about 9.5 tons per year, it tells me. The good news is that I walk to work instead of commuting each day, so I don't burn any fossil fuels on my commute. I feel pretty smug about that. On the other hand, I drive out to West Virginia most weekends to get away from the city. Overall, I feel like an average emitter, and that's what the test tells me. UNTIL...I take into account my flying. All of my flying adds another 33 tons per year of carbon emissions. This makes my carbon emissions FOUR TIMES the national average. I had heard that flying was one of the biggest culprits in carbon emissions by individuals, but I had not fully grokked that until I took the test. Boy, now I really *have* to get serious about flying less. - Thanks to investments in global health futures, the Bill & Melinda Gates Foundation is likely to overtake Microsoft in earnings next year. -In a dramatic move, KBR (formerly a subsidiary of Halliburton) is repurposing all dedicated military support operations, betting future earnings on investments in clean water and basic health infrastructure. If you had been reading the blog over at the Center for Global Development, you would know know these things. Yesterday I went to a CGD seminar by Gregory Clark, author of the new and highly acclaimed A Farewell to Alms: A Brief Economic History of the World. 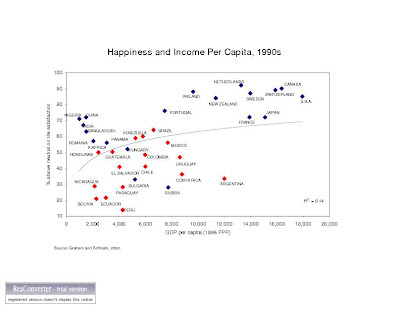 Clark presented many provocative slides that upset conventional wisdom about the dynamics of economic growth, social welfare, and happiness. But he spoke so fast that it was often hard to grasp the logic or even the points he was making. And then at the end he summed it all up into one big theory and sat down. It being a (friendly) academic setting, the panelists immediately went at Clark with an aggressive slate of questions and doubts. I have to admit I was sympathetic with the questioners. His thesis seemed rickety, even though the individual points were very interesting.In the first few rounds, Clark handled the questions well and good naturedly. And then he did something highly unusual and candid. He said, "Listen, this book took me twelve years to write, and it was murder. Many times I did not think I would finish it. I had all of these novel facts and insights but could not come up with a way to pull them all together. "Sometimes I would get two insights connected to each other, but they would be contradicted by a third. And then I would get the first and third insights in harmony, but the second one would not fit. " "It was like having a pickup truck full of giraffes and trying to get them all to duck at the same time when you're driving under a bridge." This image brought a wide smile to my face and was so endearing I will definitely buy his book. While pondering the Facebook.com phenomenon, I realize that many younger users have never seen a real facebook. 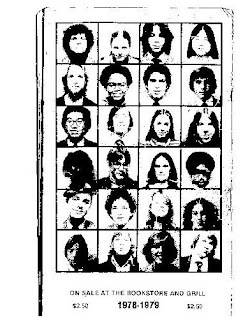 For their edification, here is the back cover of mine from 1978-79. You had to buy a facebook back then. Mine cost $2.50, which equals about $7.75 in today's dollars. By contrast, Facebook.com is free (not counting lost productivity at work for users). A few months back, NPR featured GlobalGiving on a podcast titled "Ordinary Oprahs." The host, Michel Martin, wanted her listeners to know that they did not have to be Oprah or Bill Gates to be philanthropists. GlobalGiving enables them to have a significant impact in countries around the world for $10 or $100. Bill Clinton's Global Initiative meetings start today in New York, and I can attest from personal experience that they are quite the jamboree for heads of state and large philanthropists. Clinton has done an extraordinary thing by bringing together so many powerful people to focus on international giving. Of course, not everyone can be in New York those meetings this week. But not to worry. GlobalGiving allows us all to be "Ordinary Bills." 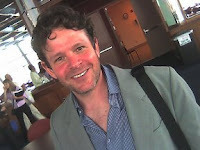 In his book At Home in the Universe, Stuart Kauffman creates a framework for predicting whether autocatalysis will occur. Autocatalysis is a form of emergence whereby molecules or other agents catalyze the creation of other molecules or agents in a manner that builds on itself. Stuart uses this framework to construct a theory of the emergence of life. His approach builds on complexity theory and is related to the "New Kind of Science" tools developed by Stephen Wolfram. Stuart posits 3 main conditions for autocatalysis, as I recall. There must be (i) a large enough number of agents; (ii) enough diversity among agents; and (iii) the right number of connections between agents (too many connections between agents is as bad as too few). His model provides actual coefficients for these variables for certain types of systems. I have always thought that it might be possible to apply the same theory to fields such as economics and the emergence of cities. The Ning platform has now reached what may be a critical mass in terms of number of agents. Ning's founder, Marc Andreesen, says in a recent post that people have now created over 100,000 social networks on Ning. He also says that there is huge diversity in the nature of the networks being formed: some are small networks of friends formed around an event - say a birthday party. Others are larger networks formed around an affinity - say for a particular sports team. The interesting question is the optimal number of connections *between* networks on Ning. Marc argues that the social networks themselves are starting to interact. If Ning can surpass critical mass in terms of numbers and diversity, and settle on the right number of links among networks, it could potentially become as big or bigger than Facebook. Just like Stuart's theory, the jury is still out. But it is worth keeping an eye on Ning. "We are sorry - that item was on backorder from our vendor. I guess we should have contacted you to let you know that it would be late." I hate shopping, so I do most of it online, and use Amazon for the majority of my purchases. But this email was not from Amazon. In this case, I had decided to give another company my business, since as much as I like Amazon, I don't want them to become the Walmart of cyberspace. 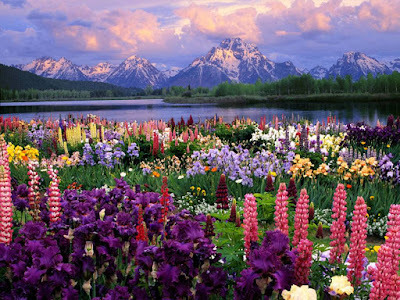 Here is the story: I had purchased some wildflower seeds. Because of my travel schedule, I had a window of opportunity to plant them last weekend. Unfortunately, even though I ordered the seeds over a week in advance - and agreed to pay a $13 shipping charge - the seeds took over two weeks to arrive, and I missed my chance to plant. I was mad, and complained to the company. When I order things from Amazon, I get a good price and free shipping. Amazon promises two-day delivery, but many times I actually receive the item in one day. Amazon's exceptional service has created new expectations that other companies either must live up to or die. I have been thinking a lot lately about what this implies for customer service in the philanthropy business. 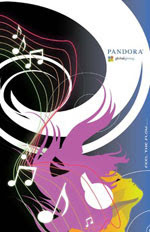 Congrats to Charles Badua, who won the Pandora poster contest, which was created to raise awareness about global causes. His design was chosen as the best among over 750 entrants. Charles's poster, along with those of runners-up Dora Radut and Andy Yamashiro are being produced in limited editions. A $10 donation to one of the projects promoted by Pandora on GlobalGiving will get you one of the posters. A $25 donation will get you all three. My platform shoes from "Saturday Night Fever" are in my closet. I don't wear them, but once in a while I peek at them. When I was a kid in the 1960s and 70s, "platforms" frequently referred to a certain type of shoes, which were all the rage. Nowadays, a platform generally refers to a "system that can be programmed and customized by outside users." Those are the words of Marc Andreessen, the creator of Mosaic (the first real web b rowser) and then co-founder of Netscape. He has recently founded an interesting service called Ning, a new type of web platform. If you want to learn about both startups and technical issues related to web software and services, his blog is an excellent place to start. He has the ability to give the reader a broad overview with just the right level of technical detail. He is also a great writer. And if you have been hearing about Facebook's amazing new "thing" but can't understand what people are so excited about, I highly recommend this blog post by Marc. The last thing I feel like doing is getting a new cell phone. The last time I did this, I lost almost all of my contacts, and setting up the replacement was a major pain. But Sprint gives me almost no choice. And the worst part is that I have been a customer for more than ten years. Last week in CA, my phone decided that half the time it would ring but not allow me either to hear the other person nor be heard. So I went into a Sprint Store in Palo Alto, and described my problem. "I am sorry; I can't help you," the clerk said. "You will have to send it in." "Send it in?" I cried. "What do you mean?" "Well, sir, you will have to send it in to our service depot." "But what would I do for a phone while it was in the mail - can't I take it there?" "Oh, yes, you could do that. There is one in San Mateo (about 15 miles away)." "So will they fix or replace it on the spot?" I hoped. "Oh, no sir. They will take it and notify you when it is ready. It can take 2-5 business days." "But what would I do for a phone during that time?" I asked. "Well, you could always buy another one," he replied. I was so stunned that I just left the store and nursed my phone until I got back to Washington, DC. Each time it rang, I said a little meditation and hit the 'answer' button. Half the time, it worked. When I returned to Washington, I decided to bite the bullet and go into a Sprint service depot, here on Connecticut Avenue. I went in. There were several lines, but no one to tell me what to do. Finally, I found a desk that said "Please sign in and we will be with you shortly." I signed in, and there were only a few names ahead of me. I was optimistic. I waited. Some time later, I saw a sign that said Drop off phones for service here. I walked over to that desk, which was empty. But I was hopeful, because I knew at least I was in the right place. No one appeared for ten or fifteen minutes. Finally another customer came over, and I told her not to get her hopes up because I had been waiting 30 minutes total and had gotten no service. "Oh, that's nothing," she replied. "I have been here more than two hours!" Five minutes later, a woman who looked like a customer service rep came in from what looked like her lunch hour, carrying various shopping bags. She said nothing - she just went into the back and disappeared. She came out a while later but would not greet any of us who were waiting. We stood there, and someone mumbled something along the lines of How can they have such bad customer service when there is such competition among phone companies? After five more minutes, I left. As you can imagine, I will be switching to another cell phone carrier soon. A few months ago, I blogged about a new service called Presto, which allows you to email your mom or grandmother even if she does not have a computer. What happens is this: You send an email to her special email address, and the email - along with any attachments such as color pictures - simply prints out at her house. Presto! I love this device because (a) it delights my mother (she can get quick email notes from her six kids scattered around the world, along with pictures of her grandkids) ; and (b) it elegantly solves a problem. Many older people are simply not comfortable with booting up a computer, logging onto email, figuring out how to launch attachments, and then figuring out how to print. In my mother's case, she can run her computer, but it is such a hassle that she rarely logs on. The nice thing about Presto is that it only prints out emails from people on my mom's white list. So no spam. I can also think of many other enterprise-related uses for Presto - printing out orders and work tickets from customers and workflow colleagues automatically comes to mind. So check this out. Even if you don't get one, you can admire it. A little knowledge can be dangerous. But if you are trying to get an education in economics with minimum time commitment, you could do much worse than reading Tyler Cowen's blog Marginal Revolution and Robin Hanson's blog Overcoming Bias. If you have more time on your hands, you might consider enrolling in the exceptional economics department at George Mason University, where they teach. Tyler and Robin have almost diametrically opposed perspectives on how one can make sense of the world. And yet, like many opposites, they have huge respect for each other. Robin is very fond of powerful theories which invoke a very small number of basic elements and give those elements great force. He likes to focus on one very central mechanism in seeking an explanation or developing policy advice. Modern physics and Darwin hold too strong a sway in his underlying mental models. He is also very fond of hypotheses involving the idea of a great transformation sometime in the future, and these transformations are often driven by the mechanism he has in mind. I tend to see good social science explanations or proposals as intrinsically messy and complex and involving many different perspectives, not all of which can be reduced to a single common framework. I know that many of my claims sound vague to Robin's logical atomism, but I believe that, given our current state of knowledge, Robin is seeking a false precision and he is sometimes missing out on an important multiplicity of perspectives. Many of his views should be more cautious. "Just don't return their calls; you don't need them." The scene was 1990 in a World Bank staff meeting. Our director, a very imposing guy, was telling us that he thought we spent too much time talking to people contacting us from outside the World Bank. His view was that we should focus on our work - in other words, process our reports and loans - and ignore everyone else. Last week, a friend told me that she had been in discussions with a potential partner on a deal, but that suddenly her emails and phone calls were no longer returned. She felt powerless, since she was dealing with a very large company, and her own start-up was at the mercy of the partner. This reminded me of my own path over the last few years. In late 2000, I was a powerful person after 14 years at the World Bank. As co-head of the Corporate Strategy and Innovation Groups, I had many staff and huge resources at my disposal. When I called people, they left other meetings to take my calls. Emails were returned instantly. In my last few months on the job, I was overseeing the allocation of the World Bank's entire $1.2 billion administrative budget, and senior executives went out of their way in the staff cafeteria to come say hello. All of this changed on October 15, 2000, when I resigned from my job to help create GlobalGiving. Suddenly, my co-founder and I had no staff and no power. No one returned our calls. The office was quiet: no one came to visit. We were on our own. It was one of the most humbling and frustrating experiences of my life. But then I realized: this is what life is like for almost everyone outside the walls of power. 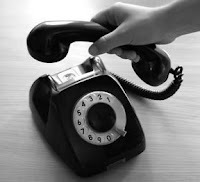 Now, after much hard work, many people have heard about GlobalGiving, and my calls usually get returned. But my experience made me determined not to repeat old patterns. Having experienced both ends of the power spectrum, I identify with the people who contact our office every day wanting to post a project or offer their expertise. We are trying hard here at GlobalGiving to have a culture of responsiveness. Although we still feel small in the grand scheme of things, we are often perceived by those who contact us as the powerful one. As we continue to grow, I want us never to never lose sight of that. Check it out: we have re-launched GlobalGiving with a whole lot of new features, including widgets like the one above that you can add to your blog, Facebook profile, or MySpace page. "Dennis, do dogs use deodorant?" It was a sweltering day out there a couple of Saturdays ago, and I was sitting on the neighbor's porch with Kobe and Alvin. Usually we spend an hour in the morning cleaning up the remnants of Friday night from the sidewalks in our neighborhood. Kobe and Alvin, ages 8 and 11, live nearby, and they work with me to earn a few bucks. Then we usually go to 7-11 to get a drink, or to Ben's Chili Bowl for lunch, or sometimes to the Thurgood Marshall Center to play basketball. But that day was too hot to work. So we had taken refuge on the front porch next door and were just sitting there in the shade and passing the time doing nothing. "What do you mean, do dogs use deodorant?" I replied to Kobe. "Well Alvin says that dogs use deodorant, but I say they don't," Kobe replied. I didn't know what to say; I just smiled and thought back to those hot summer days when I would sit around with my own older brother, who would spin tales and deliver random facts, many of them made up (I realize now) for his entertainment. 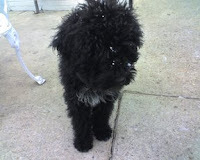 "Some dogs do, and some dogs don't," I told Kobe, and left it at that. I have been in Europe three times over the past year for business, including trips to Spain, Portugal, England, France, and Switzerland. And not too long ago, I visited a sibling in Ireland. On all these trips I was astonished at the progress being made by the historical experiment called the European Union. Although not all countries are fully on board with this experiment, its impact has been profound. I am amazed that the French gave up their beloved francs, and the Germans their rock-solid marks, in favor of a highly uncertain new currency called the Euro. England has not yet given up its pounds, but many merchants already accept Euros, which are becoming a second currency there. In addition to the common currency, the common labor market has had a very tangible impact: when you check in at a hotel or eat at a restaurant you are likely to be greeted by someone from another country. (It also means that the quality of food served has risen significantly, on average, in the countries I have visited.) But what has impressed me most is the EU's far-sighted "equalization" scheme. Under this scheme, the richer countries contribute money to a pot that is then allocated to the poorer countries. This scheme has funded major infrastructure projects in the poorer countries such as Ireland and Spain (which have prospered hugely over the last decade) and Portugal (which is still poor but making progress). After a long stagnation, these countries are building and improving roads and bridges and public places. The improved infrastructure, combined with the freer movement of talent, goods, and capital, have resulted in rapid growth in many of the poorer countries. They have also unlocked hidden sources of growth in the richer countries, which can now deploy their capital and labor more efficiently and have a larger market for their goods. As a result, they are becoming far more cosmopolitan, and opportunities for younger people have expanded dramatically. While change always has its costs, you can feel the vibrancy in the air in the countries I have been to recently, and the benefits seem to far outweigh the problems. But regulation of the internet and cell phones is one glaring failure in Europe. Public access to the internet in the UK and Europe remains very expensive – I have had to pay between $20 and $40 per day in hotels in London and Portugal recently, which is a huge extra cost of doing business there. And I was effectively unable to do my normal business when staying with a friend in Paris, because the modem system at her home was incompatible with my computer. And don’t get me started on cell phones. I recently purchased a plan here in the US that gives me 1,000 minutes of calling anywhere in the US for just $39. By contrast, it often costs $2 per MINUTE to call across country boundaries within Europe. EU regulators have pledged to cut this in half, but that would still mean my 1,000 minutes could cost me up to $1,000 per month! For developing countries, telecommunications is a core part of their infrastructure. Recognizing this, many developing countries are taking steps to ensure that access to the internet and cell phones is freely available and relatively inexpensive. That is one area where they are well ahead of the new Europe. You're Fired - Here's 35,000 Euros! The French Paradox is not only about how you can eat lots of fatty food and stay skinny. It is also about how you can have a relatively state-oriented, rigid economy that increases the cost of labor, produces high unemployment and still have a reasonably high standard of living. I was in France this past week for a couple of days, and a friend there told me a story about how hard it was to fire her babysitter - even after the babysitter had scalded another friend's child, requiring hospitalization. Firing the babysitter for unsatisfactory performance turned out to be almost impossible(!). So she decided to take another route that was legally easier: she informed the babysitter that she had found a state-supported childcare center for her child. Still, my friend had to go through an elaborate process of sending formal letters (worded just so) to the nanny, waiting a specified number of days, then inviting her to a meeting, the purpose of which was to inform the babysitter that she would be fired, and then waiting a certain number of days before sending a letter informing her that she was in fact fired. "Why go through all that?" I asked. "Because if you don't you can be sued," my friend replied. She then told me the story of a friend of hers who had to pay a fired employee 35,000 Euros after failing to put the right words in the letter and failing to observe the specified intervals between initial letter, meeting, and firing letter. She also said that large companies generally find it impossible to fire poor performers workers. Instead they often send them home with pay, sometimes for a couple of years, until they can reach a severance agreement that usually involves a large payment to the slacker. And yet, despite its problems, France remains one of the world's largest economies, and Paris is vibrant - and one of the world's greatest cities in all dimensions (except for the lack of air conditioning on the metro and suburban trains; the lack of taxis at night and on the weekend; and the lack of service in restaurants-but knowing how hard it is to fire waiters, I am now a little more understanding). So what gives? How can an economy with such an inefficient labor market survive? In the end I came up with the following hypothesis: very strict education, starting young, and a relatively meritocratic system of advancement to the higher schools and university. Earlier that day, I had spent time with my friend's 9-year old son, a product of the French school system. I was astounded by his knowledge of everything from the history of space travel to the nuances of the New York subway (and he had never been to New York). And his smarts were not just limited to facts; he had confident, nuanced opinions and theories on why certain things were the way they were. Admittedly, he was probably above average intelligence given his parents, but still I was rocked by his sophistication compared to nearly all 9 year olds I have met anywhere else. This is at least partly a result of strict schooling starting very young (some say too strict, and having tasted a little of it myself when I was young, I tend to agree). And the curriculum is accompanied by a never-ending series of national exams that determine where each person is able to go to university and professional school. So my theory is that by the time they get to the workplace, most French workers have been heavily conditioned from an early age that they must work hard and perform. This means that the number of slackers is relatively small compared to most other countries. And this in turn means that French workers are on average productive enough to make the economy go. The system is bad, but the unusually high quality of the work force makes up for it. But before the French get too complacent, there is an alternative explanation. The formation of the EU has led to much freer markets for labor, goods, and capital. This undoubtedly has enabled France to realize huge gains from deploying labor and capital more efficiently, and by creating larger markets for its goods. In the mean time, even without the reforms, there is no apparent crisis, thanks to the training and conditioning of the workforce (and probably the formation of the EU). Though problems loom in the long term, France will continue in the short term to survive, and life will be good. And that is the French Paradox. 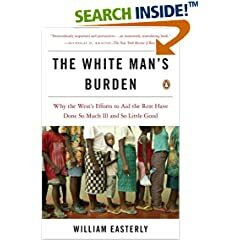 White Man's Burden, by William Easterly. This book is an in-depth exploration of the structure of the aid industry. The bottom line is that aid is done mostly by top-down "planners" rather than bottom-up "searchers." In my view, this book is the best pointer to the future of where aid needs to go. How to Change the World, by David Bornstein. David does in-depth stories about a number of incredible "social entrepreneurs" who are changing the world by introducing innovations in the economic, social, and environmental spheres. These people are superb examples of the "searchers" that Bill Easterly talks about, and they are the type of people who lead projects listed on GlobalGiving. 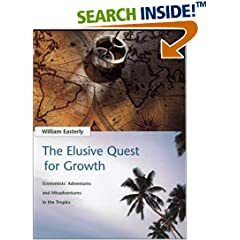 The Elusive Quest for Growth, by William Easterly. This book is about all th e grand theories underlying foreign aid over the past 50 years, and about the lack of evidence that any of them have worked. 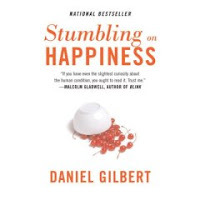 In addition to being very entertaining, this book will arm you against the charlatans out there (including some prominent ones) who are trying to re-bottle old, failed approaches and sell them as new "breakthroughs." If you read these three books, you will be well on your way to being an effective philanthropist, aid worker, or just informed citizen. Recently I was invited to Oxford University to speak at an excellent conference led by Ngaire Woods and Ravi Kanbur on new directions for international aid. As with many such conferences, there were calls for better partnerships between aid organizations. There is understandable frustration in some countries with too many aid agencies and NGOs tripping over one another and "doing the same thing." There is also a sense that the aid industry is under-funded, and that it is wrong for any organization to "waste" resources by doing the same thing another agency is doing. I have heard this same old complaint so many times over the years that I could not take it any more. So in my talk, I said that this is the wrong way to look at it. The problem is not duplication. The problem is the lack of a market-type mechanism to ensure that over time more resources flow to the agencies providing the best service. Focusing on partnerships often implies a zero sum game, based on a scarcity of resources that need to be parceled out carefully. Markets, by contrast, are a non-zero-sum game, since market-based transactions by their very nature create new value. Can you imagine if there was only one cell phone manufacturer in the world? Do you remember how big and heavy those first cell phones were? Last time I checked, there were literally hundreds of cell phone choices available, with all sorts of different features, and at all different prices. Different people buy different phones based on their own particular needs, preferences, and resources available. By contrast, this choice is not easily available to governments or communities looking for help in growing their economies and improving their societies. And calls for more partnerships in the aid industry are actually calls for restricting this choice even further. If Microsoft and Google announced a new "partnership" to provide a single search utility, there would be loud cries of "monopoly" and out anti-trust regulators would get to work right away to protect the interests of consumers. Why don't we hear the same cries when the UN and the World Bank announce a joint, coordinated program to provide clean water to poor people? I expected my speech at Oxford to elicit protests from some of the senior aid people there. But you know what? Deep down they know what I was saying is true. In this fast-paced world with innovations leaping out at us from every angle, no one likes working in a kludgy system that is unable to respond to what the world needs now. And aid officials are no exception. And they're off! Voting is now open in the GlobalGiving Filmfest. We asked amateur videographers to create short videos that would bring alive the impact of projects on GlobalGiving. Thirteen finalists are now posted on KarmaTube - and the styles vary widely. I was going to highlight one or two here, but I was afraid I might influence the voting. So check them out, vote, and let me know what you think!